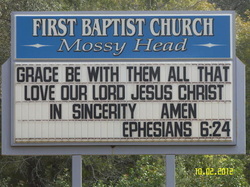 The First Baptist Church of Mossy Head welcomes you. We are a Southern Baptist Church serving the Mossy Head, FL and nearby communities. We are a part of the Walton County Baptist Association. We offer a variety of Services, Programs and missions for you and your family. ^The Weds following the First Sunday is our Business Mtg night with dinner at 5:30 PM. *NOTE TIMES: Our church meets for worship at 5:00 PM and regroups for Discipleship Training at 6 PM in small groups. The kids and Youth also meet in their groups following the worship service.